There were two different Soviet tanks with the IS-4 designation. One of these was the Object 245, which was an IS-2 revised with a long-barrel 100-mm (3.94-in) D-10T gun. The other was a new vehicle projected in parallel with the IS-3 (Object 703) by the same LKZ design and development bureau. For this second iteration of the IS-4 designation, the hull of the IS-2 was lengthened, an additional set of road wheels being added, and an improved engine was installed. The armour of the hull and turret armour was also increased and, after several alternative armaments had been considered, the IS-2’s original 122-mm (4.8-in) gun was retained. Efforts were also made to exploit technical features derived from study of the German Panther battle tank of the World War II period, and this influenced the configuration of the second IS-4’s engine cooling system. The tank was approved for production from 1947 to 1949, but the type proved to have speed and mobility levels which were considered to be disappointing, so only 250 of the vehicles were built. Most of these were deployed to eastern Siberia in reflection of the fact that they were considered to be lacking in capability for possible service against the Western allies. The tanks had only comparatively short service careers after production ended in 1949. Yet again, there were two different tanks with the designation IS-6, which was the model number which followed the IS-4. The Object 253 was characterised by the USSR’s attempt to develop a practical electrical transmission system for heavy tanks. Similar systems had been tested previously in France and the USA, and had been used with some success in the German Elefant (otherwise Ferdinand) heavy tank destroyer in World War II. The experimental transmission proved itself to be unreliable, and was also dangerously prone to overheating, so development was soon discontinued. The alternative Object 252 shared the same hull and turret as the Object 253, but had a different suspension arrangement without track-return rollers, and its engine drove a conventional transmission of the mechanical type. The Object 252 design offered no significant advantages over the IS-2, and thus the entire IS-6 project was terminated. The five-crew IS-7 heavy tank was developed in 1948 and built to the extent of three prototypes. Turning the scales at 149,912 lb (68000 kg), possessing thick armour, and armed with a 130-mm (5.12-in) S-70 L/58.5 stabilised naval gun, the IS-7 was the largest and heaviest of the tanks of the IS series. Despite its weight, the tank proved easy to drive as it was fitted with a number of hydraulic assistance elements. Loaders also noted with approval that the IS-7 was comfortable and that the autoloader was easy to use and provided a rate of fire of eights rounds per minute. The tank was also capable of 37 mph (60 km/h) as it had an engine rated at 1,050 hp (783 kW), and this provided a power/weight ratio which was better than those of most medium tanks of the period. The armour was tested under operational conditions, and revealed itself to be immune to the projectile of the Jagdtiger tank destroyer’s 128-mm (5.04-in) PaK 44 L/55 gun, and also proof against the projectile of its own type of 130-mm (5.12-in) gun. For reasons unknown, most probably the political moves against the ‘Leningrad bosses’ of the same year, but also possibly due to the mobility issues attendant on its weight, the IS-7 did not enter production. Clearly, the IS-7 was able to use few bridges and very little in the way of rail transport, and no Soviet (and indeed Russian) tank accepted for service after this time massed more than 121,252 lb (55000 kg). 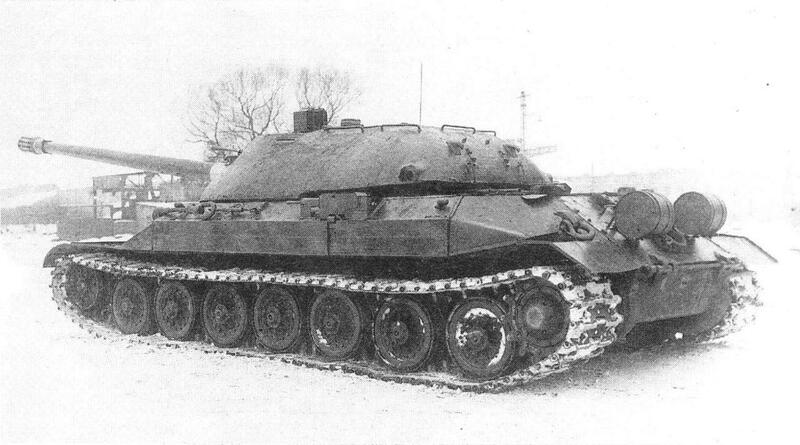 The IS-10 was also known as the Object 730, and was the final development of the KV and IS tank series. It was accepted into service in 1952, and in the revised political climate following the death of Iosif Stalin in 1953, it was redesignated as the T-10. The most significant changes between the T-10 and its direct ancestor, the IS-3, were the later tank’s lengthened hull; seven rather than six pairs of road wheels; an enlarged turret mounting a new gun fitted with a fume extractor; an improved Diesel engine; and thicker protective armour. The general performance of the two types was similar, although the T-10 could carry more ammunition. Like the earlier types which it replaced, the T-10 was deployed in independent tank regiments allocated to armies, and independent tank battalions allocated to divisions. These independent tank units could be attached to mechanised units for the support of infantry operations and to achieve breakthroughs. 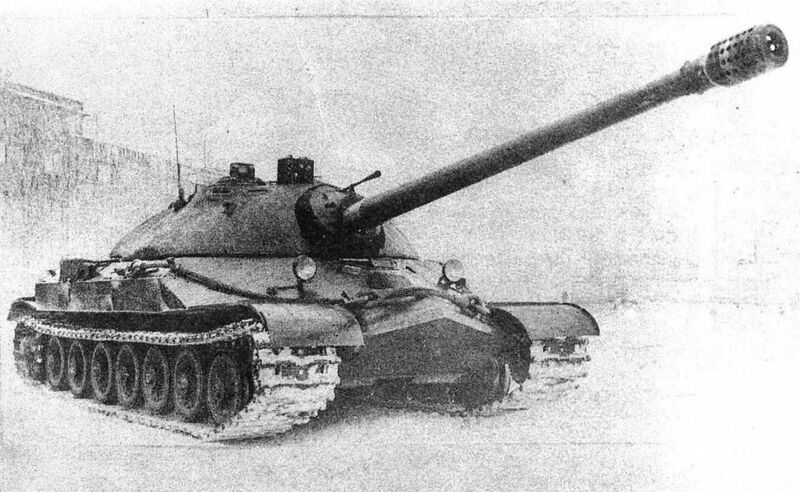 The T-10 was the final Soviet heavy tank to enter service, and was replaced in first-line formations by the T-64 main battle tank when this became available. The IS-2 entered combat early in 1944, when the type was assigned to separate heavy tank regiments, each usually of 21 tanks. These regiments were used to reinforce the forces of the most important attack sectors during major offensive operations, and were used tactically as breakthrough tanks. The role of the IS-2 was therefore the support of assault infantry, using its main gun to tackle German bunkers, fortified buildings, emplaced crew-served weapons, and other softer targets. However, the IS-2 was also able to engage any type of German armoured fighting vehicle if needed. 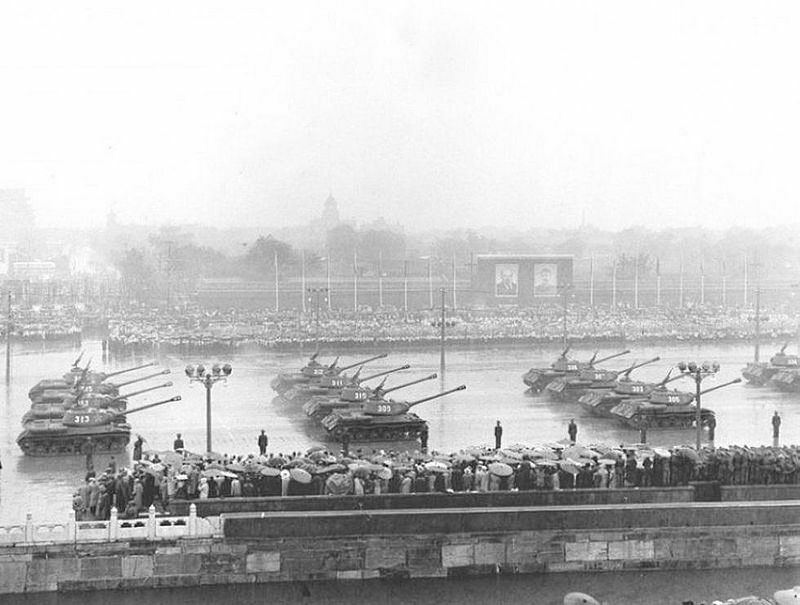 Once a breakthrough had been achieved, the IS-2 was replaced by the lighter and more mobile T-34 medium tank for the exploitation phase of the operation. By the 1950s the emergence of the main battle tank, which combined in a single vehicle the mobility of the medium tank and the firepower and protection of the heavy tank, left the heavy tank effectively obsolete in the Soviet operational doctrine of the period. In the late 1960s what was still left of the Soviet heavy tank force was transferred to reserve service and thence largely to storage. Other nations which received tanks of the IS series were China (60 IS-2 tanks operated during the Korean War and in concrete bunkers along the Sino-Soviet border), Cuba (41 IS-2M tanks delivered in 1960), Czechoslovakia (eight IS-2 and IS-2M tanks in service between 1945 and 1960; and two IS-3 tanks delivered in 1949 used only for trials), Egypt (unknown number of IS-3M tanks used between 1956 and 1973), Israel (unknown number of IS-3M tanks captured from Egypt in 1967), North Korea (small number of IS-2 tanks), Poland (about 70 IS-2 tanks used in combat between 1944 and 1945; 180 IS-2 tanks survived in 1955, and remained in declining service until the 1960s, some then being converted to armoured recovery vehicle standard), Romania (about five IS-3 tanks) and South Ossetia (limited number of IS-2, IS-3 and T-10 tanks operated to 1995). The data for the IS-2 in its 1944 initial variant, included a crew of four, weight of 191,411 lb (46000 kg), length of 32 ft 5.75 in (9.90 m), width of 10 ft 1.67 in (3.09 m), height of 8 ft 7.33 in (2.93 m), armour between 30 and 120 mm (1.18 and 4.72 in) thick, main armament of one 122-mm (4.8-in) D-25T gun with 28 rounds, secondary armament of one 12.7-mm (0.5-in) and three 7.72-mm (0.3-in) machine guns, powerplant of one V-2 water-cooled V-12 Diesel engine rated at 600 hp (447.5 kW) and provided with 180 Imp gal (820 litres) of fuel, speed of 23 mph (37 km/h) and range of 150 miles (240 km).